I sneaked off last week, did you miss me? I spent a week in Spain, just outside Puerto Banus; I found the sun ( must tell Sandra) enjoyed some lovely food and a really relaxing time. I missed Friday Fictioneers due to poor internet connection, so have a lot of catching up to do. Thanks go as usual to Rochelle Wisoff-Fields for keeping FF going each week, where would we be without her? Thanks for the photograph this week go to Janet Webb. It is very intriguing and I’m sure it will provide some very imaginitive stories from the great writers who support Friday Fictioneers every week. Larry looked up, the dress was still there. It was magnificent. Molly would look fantastic in it. He imagined her on his arm, walking together into the Annual Dinner; making a great entrance, the talk of the club for once. They were broke, but she deserved something new. If it was still there tomorrow night, he’d climb up and take it. Antonio looked up at the painting and smiled, he had the perspective just right. He went back upstairs to his ‘studio’ and added the few brushstrokes needed to finish it. Poor Larry, his dreams shattered for lack of artistic awareness and understanding! However Antonio is obviously extremely talented! Well done, loved it! Haha! I was wondering whether to praise Larry for his obvious love for Molly or to scold him for his planned theft! Totally unexpected ending–thanks for the surprise! 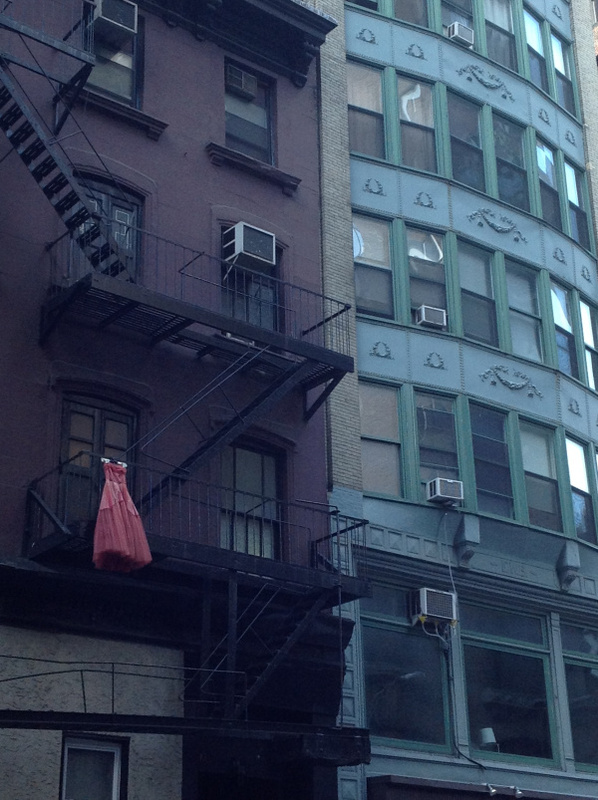 Well done … Love that take.. wonder if the fire escape is fake as well? Very creative!! 🙂 Glad you had fun in Spain. I’m envious. It was a lovely break, really enjoyed it. I love it! I love it, I love it, I love it. The last line was the finishing touch. Great take on the prompt. Loved it. And yes, I’ve found the sun now. I was right, it was hiding in Spain. Mmmmm! I hate to admit I have missed something, but ask you to share the meaning. Hi Joe – I was trying to show that sometimes what you see and experience isn’t always what you think it is. It’s a clever idea. I like it … but I’m confused by “He went back upstairs to his studio and added the few brush strokes…” This seems to suggest the dress isn’t in fact painted on the outside of the building. And if it isn’t, then what’s Larry looking at? Sorry to confuse you – the painting is on the outide of the building. When I posted it, the word studio had inverted commas round it, my intention to suggest that it wasn’t really a studio at all. I see that they aren’t there, I will correct. Oh..lol..well stealing ain’t right, anyway. Thanks for reading. Glad you checked out Trompe l’Oeil – there are some clever artists out there, some of their paintings are just amazing. A great take on the prompt. A bit sad for poor larry! Nice story. Thanks Hannah, sometimes you really can’t believe what you see! Ah but it’s the thought that counts. Yes that would be interesting to watch. Haha! So clever. This is a very imaginative piece. I think Larry will have a shocking revelation! I think he’d better take care!! First of all, we did miss you last week, Dee. Great take on the prompt. Poor Larry. I was not familiar with Trompe-l’ceil either and had to look it up. Thanks for teaching me a new phrase. Glad you liked the story. I am so amazed by the artists who produce works of Trompe l’Oeil, I have difficulty drawing a straight line.